After challenging courses in his last two races, Reuben Stoby extended his winning streak during Saturday’s Blenheim Trust 5K Series race in Paraquita Bay, dubbed the Paraquita Beast. Stoby—in a final tune up for this weekend’s 4th Virgin Gorda Half Marathon—covered the 3.1 miles loop in 19 minutes and 18 seconds. He was followed by Julius Farley who overhauled Rodrigo Dos Santos and placed second in 19:54 with Dos Santos turning in a time of 20:14. Katrina Crumpler—in her first individual race after running a personal best of 3 hours 22 minutes and 53 seconds in the Boston Marathon—was the women’s winner in 21:55. Rosmond Johnson followed in 24:24 and Anna Kinkead was third in 25:07. 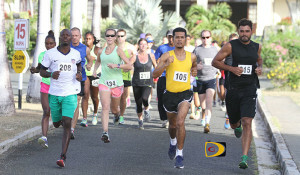 With just one incline that didn’t exceed 250 feet, Stoby said the course was a “baby” compared to the Dive BVI 10k race on Virgin Gorda the week before. 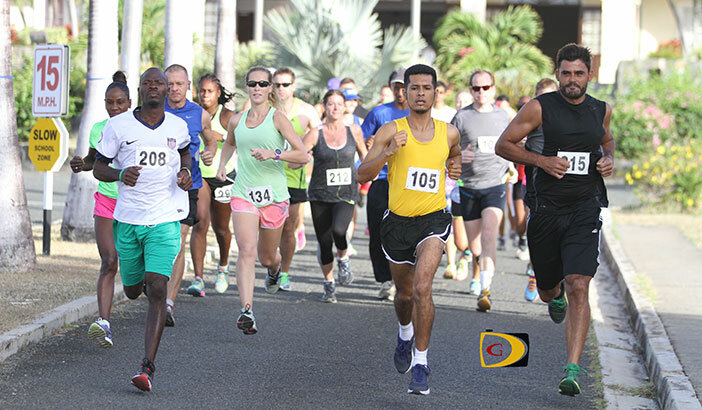 The National 5K Championships is set for Saturday, May 16 in Road Town, starting and ending on the A. O. Shirley Recreation Grounds. Final Results. Men: 1. Reuben Stoby, 19:18.25. 2. Julius Farley, 19:54. 3. Rodrigo Dos Santos, 20:14. 4. Paul Hubbard, 21:28. 5. Tom Wilson, 23:23. 6. Russell Crumpler, 23:34. 7. Shane Donovan, 23:58. 8. Marcus Rodrigues, 24:48. 9. Dan Wealthy, 26:11. 10. Claudius Rhymer, 26:12. 11. Guy Williamson, 27:44. 12. Ruairi Bourke, 28:28. 13. Andre Kartick, 30:13. 14. Marvin Flax, 30:48. 15. Howard Moore, 31:08. 16. Barry Leon, 37:47. 17. Dennis Dela Cruz. Women: 1. Katrina Crumpler, 21:55.78. 2. Rosmond Johnson, 24:24. 3. Anna Kinkead, 25:07. 4. Emma Holmes, 25:19. 5. Julianne Potgeiter, 26:12. 6. Kay Reddy, 26:22. 7. Claudia Ferrari, 26:45. 8. Rhiannon Jones, 27:08. 9. Lauren Julien, 27:44. 10. Philomena Robertson, 27:52. 11. Sarah Caroll, 28:44. 12. Lisa Bridson, 28:44. 13. Jenni Dobbie, 29:16. 14. Darwn Peters, 29:28. 15. Jude Holmes, 30:28. 16. Sarah Graham, 31:12. 17. Clair Burke, 31:58. 18. Claire Santillian, 33:06. Power Walkers: Shirley Liburd, 49:20. 2.= Linda Li, Sophie Bennett, 49:30. Boys One Mile: Charlie Potgeiter, 8:17. 2. Sebbie Morgan, 11:53. 3. Xavier Morgan, 12:10. 4. Stan Carroll, 13:22.